So you want to run a MSD Blaster 2 on your turbo Dodge? - Page 3 - Turbo Dodge Forums : Turbo Dodge Forum for Turbo Mopars, Shelbys, Dodge Daytona, Dodge SRT-4, Chrysler PT Cruiser, Omni and more! Turbo Dodge Forums : Turbo Dodge Forum for Turbo Mopars, Shelbys, Dodge Daytona, Dodge SRT-4, Chrysler PT Cruiser, Omni and more! > Turbo Dodge Technical Chat > Engine Management, Fuel, Spark, EGTs, and Air/Fuel Ratios > So you want to run a MSD Blaster 2 on your turbo Dodge? Re: So you want to run a MSD Blaster 2 on your turbo Dodge? Yes You Can Run A Blaster #2 Without a BALLAST ! I've Been Running A MSD Blaster 2 For Years On My 89 2.5 Reliant Coupe Without A Ballast, Runs Much Better With Blaster 2 Coil ! WARNING: During installation, disconnect the battery cables. 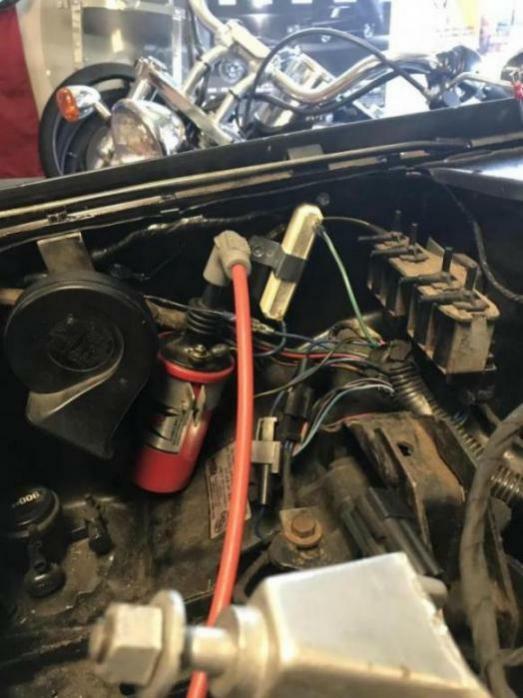 When disconnecting the battery, always remove the Negative cable first and install it last. Points Distributor the ballast must be used. " Late Model Electronic Ignitions Or An MSD Ignition DO NOT Require The Ballast. 1. Label the location of the coil wires (+ and -) and remove the wires from the coil. 2. Remove the high voltage wire from the coil and remove the coil from its mount. 3. Position the Blaster Coil in the mount and tighten. Note: The Blaster Coil will mount in most factory canister coil mounts. MSD also offers a Chrome Bracket, PN 8213. It is recommended to mount the coil in an upright position. Last edited by blown426hemi; 02-28-2016 at 05:20 AM. I already have an MSD blaster 2 coil. Does anyone know the correct part number for the resistor? I am reading that the stock coil is 1.4, the resistor from s\Summit posted above was .8. Should the resistor be 1.4 or the .8? I also have the upgraded ground kit on the car as well. Thanks for the education. The MSD coil is only 0.7 ohms primary resistance. You need to add a ballast resistor of 0.6 - 0.8 ohms to bring the primary circuit resistance into Chryslers specs. The resistor is placed in the + coil circuit before the coil. Or you can just use the proper Accel Coil and be done with it. The Factory coil and the Accel coil both provide the same exact KV requirements @ idle/cruise and under load as the MSD Blaster coil and the Accel is a direct Mopar replacement that has the proper primary resistance. There is nothing to gain performance wise by just replacing the coil. Now, if your factory coil has failed replacing it with an Accel or MSD over other Aftermarket coils is an upgrade. 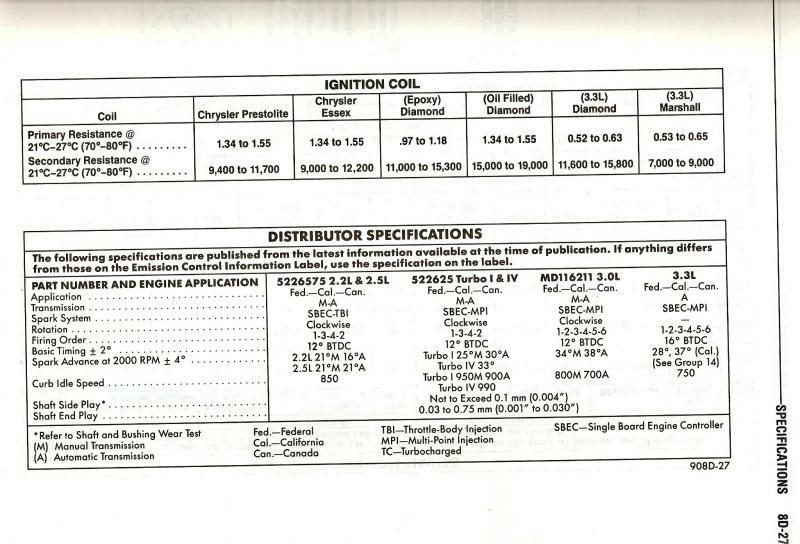 Unless you have major ignition system issues (which means repairs are needed) or are running Extremely High Boost the KV requirements needed for current to be able to jump the gap at the spark plug will never reach 40 KV. Well there ya go. Glad to see it's going to be done right, maybe you've got a story to tell at the next car show and a little extra under-hood bling. On my 1990 Omni TBI, I installed an MSD6AL box, and a Blaster 2 Coil in the stock, somewhat tilted location. This was several years ago when I first bought the car. I have been running this setup for roughly 105,000 miles. I changed the HEP once but it was actually the ignition rotor that had failed at the time. I keep the old one in the glove box for a spare. I have also installed the long reach plugs about 5,000 miles ago. I am fairly sure the coil has been fine in the stock mounting position the whole time. I hope this angle is good. It can’t go straight up without hood hitting it. I put the .8 ohm resistor and Blaster 3 in.